SREH: (starling-resistant entrance hole) designed to prevent cavity entry by all but the smallest of cavity-stealing European Starlings. Durable: Troyer Gourds are blow-molded in white (sun-reflecting), opaque, high-density polyethylene plastic. They won't rot, peel, split, or crack out in the elements, and won't break if accidentally dropped like natural gourds can. Because they are molded with ultraviolet inhibitors added to the plastic, they have a long life expectancy with virtually no maintenance other than giving a quick scrub at the end of the season. The Troyer Tunnel is injection-molded using opaque UV-inhibited plastic. Easy to Hang: Troyer Gourds can easily be hung underneath an existing martin house or from an any of the gourd racks we offer. No Need to drill a hanging hole, they come pre-drilled with a 3/8" hanging-hole. Landlords will need to assemble the Troyer Tunnel on to the molded-in collar on the gourd. 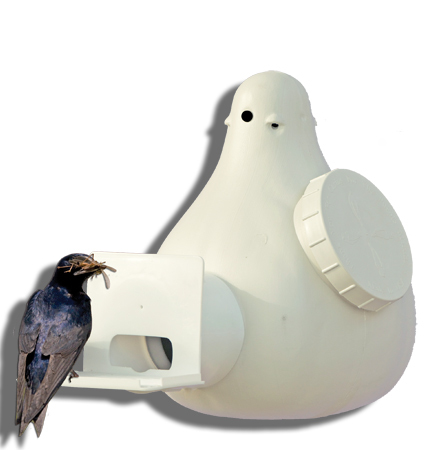 Designed to Benefit Purple Martins: The Troyer Vertical Gourd reduces the risk of owl predation, due to its overall length of 13". The tunnel is trap-compatible for trapping House Sparrows with the optional Troyer-Haskell Tunnel Trap (THTT). The extra-wide porch on the gourds give martins a place to lounge in the sun and the inner tunnels now have a wing-entrapment guard and traction tread. Each gourd has an additional perch area with traction on the Tunnel and comes with a pre-drilled 3/8”, front-to-back hanging hole. Gourds have high occupancy rates, plus reduce the incidence of fallouts and premature fledging. Now, busy landlords can offer their martins all the advantages of properly-prepared gourds, without investing the time and effort required to grow natural gourds, then add access doors and canopies, or repaint them every year or so. Landlord Friendly: Troyer Gourds are low-to-no maintenance martin housing; no sanding or painting, and nothing to add except stick-on numbers. Everything a person needs to be a better landlord is already there. Balance the cost of a Troyer Gourd against the years of low-maintenance use you'll get and the advantages for the martins. Then compare the occupancy rate and cost to other types of housing that have, at best, 50% occupancy, or that require annual repainting. 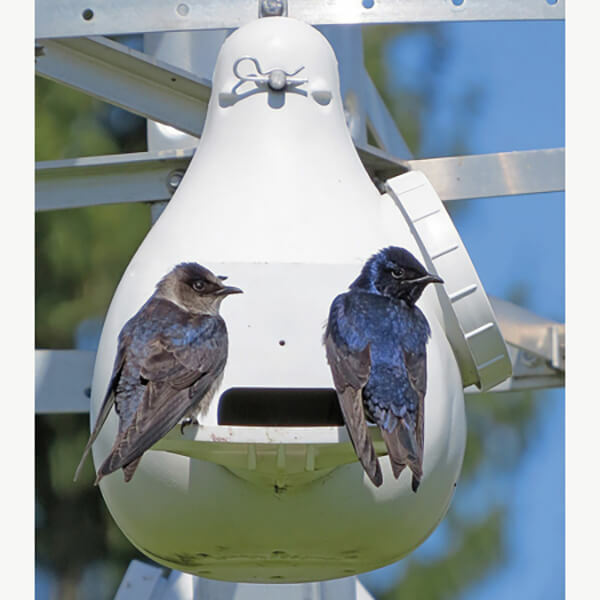 Easy Parasite Control: Nest parasites can decrease nesting success in Purple Martins by 50%. In a Troyer Gourd, any parasite problem can be remedied simply and safely with a nest replacement. The access port and smooth interior make this easy. Troyer Gourds have no seams, joints, or crevices in which parasites can hide, breed, or overwinter. No other type of martin housing can claim this advantage. Gourd Interiors: Troyer Gourds have plenty of room for three to six martin young to grow. We recommend placing a few handfuls of pine needles in the gourds before the martins return as well as two nest changes when the young are between 5 to 10 days old and 15 to 20 days old. The Troyer Vertical Gourd is available in many price saving quantities.